You can appoint me for courses and independent advice in Process Innovation and Scale-up in relation to Sustainable Development. Take a look at the courses and workshops the Process Technology Academy can offer your company’s sustainable goals and needs. Recently I have provided a risk assessment and risk mitigation advice for a large process development project. Something of interest to your project? A book for the industrial innovation practioner, as well as for academic teachers. It provides knowledge for each innovation stage, Discovery, Concept, Feasibility, Development, Detailed Design, Start-up, and for each academic level, BSc, MSc, PDEng, PhD. The three main authors and the three supporting authors, have both industrial experience and academic teaching practice. A lot of their tacit knowledge has now become coded knowledge, in addition to the 365 references used in this book. A book for teaching sustainable design, as well as executing sustainable design. It follows a step-by-step approach. The authors experience in teaching sustainable development and design has been consolidated in this book. 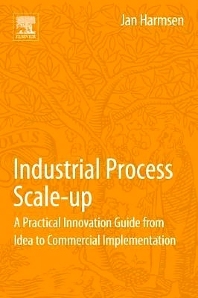 A book for the industrial process innovator. She or he will always find interesting items critical to successful scale-up and easily overlooked. It covers both integrated process scale-up as individual unit operation scale-up methods.